President Emmerson Mnangagwa's claim that former Finance minister Tendai Biti was released on bail following his intervention undermined the public's confidence in the judicial system, legal experts have warned. Mnangagwa made the announcement on Twitter on Thursday minutes after Biti was granted bail on charges of allegedly inciting public violence and illegal declaration of election results. The leading opposition figure was deported from Zambia despite a court order allowing him to stay in the neighbouring country while his application for asylum was being reviewed. Former Justice deputy minister Obert Gutu said Mnangagwa's "intervention" raised questions about the independence of the prosecutor-general's (PG) office. "I was taken aback by that tweet because the constitution establishes the independence of the PG's office," he said. "As a lawyer, I was disturbed obviously assuming that the tweet was official. "You don't want the office of the president or any other office or any quarter interfering with the PG because it should prosecute without any undue influence." Law Society of Zimbabwe president Misheck Hogwe said the tweet implied that Mnangagwa influenced the decision of the police and the National Prosecuting Authority. "If the statement is true, it's very unfortunate because it insinuates that the president either interfered with the police or the PG's office so that bail would not be opposed," he said. "If that is what happened, obviously it was improper. What is expected is that the president should allow the office of the PG to operate freely and excise their own judgement. Obviously from a rule of law perspective, it is cause for concern." Ray Goba recently resigned as prosecutor-general after Mnangagwa said he was not happy with the way corruption cases were being handled. Goba resigned last week after he was suspended pending an investigation to determine whether he was still fit for the office following a litany of allegations against him. Fears that the executive interferes with the judiciary are not new, but the government has always denied accusations that it influences sensitive court cases. Zanu PF secretary for legal affairs Paul Mangwana denied that Mnangagwa had intervened in Biti's case, saying the president's tweet was misinterpreted. "It is not correct, he did not intervene. He has no authority over the courts or the PG's office," Mangwana said. "It [tweet] was misconstrued. It was meant to convey his feelings that he would have supported that Biti be given bail. "The courts made their own decisions, bail was only granted after submissions from the defence and prosecution. "I wish to state that the doctrine of separation of powers is respected in this country." On Friday, Biti told the magistrates court that Zimbabwean security officials had pursued him last Wednesday when he tried to flee to seek asylum in neighbouring Zambia, but were stopped from wrestling him into a waiting vehicle at the Chirundu border post by a crowd of traders waiting to cross. It came less than a week after results were announced in Zimbabwe's presidential election, the first since Robert Mugabe was ousted in a military takeover last year after nearly four decades in power. Hopes that the relatively peaceful campaign and voting would herald political and economic transformation of the impoverished country have been dashed by violence and alleged human rights abuses since the poll. 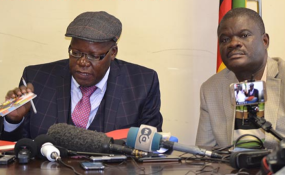 The United Nations, Canada, the European Union, the United Kingdom and several international observer missions have issued statements expressing concern at the treatment of Biti and the broader repression in Zimbabwe since polling day. Biti, who was granted bail of $5 000 and told to surrender his passport, is also being charged with falsely and unlawfully announcing the results of the July 30 election. Eight other MDC leaders are being sought by law enforcement agencies. On Thursday afternoon, prosecutors accused Biti of inciting protesters on August 1, urging them to pull down a Mnangagwa campaign poster while telling them: "Remove that poster, we don't want thieves in this country." The protesters went on to burn the poster while damaging property at Zanu-PF's offices in the capital. Six people were later shot dead by soldiers as the military moved to quell protests in central Harare. Biti told the court that he had sought political asylum in Zambia out of fear for his life. "I have been a human rights lawyer and a political activist since 2000, but I have never felt so threatened in my political life like I have felt in the past seven days. It is unprecedented," Biti, who was imprisoned and tortured in 2008, told the court. The 52-year-old politician said his brother's car had been shot at and his mother's home surrounded by unmarked vehicles at night.